In this guide we’ll look at the best RC planes for beginners. What Are The Best RC Planes? The F-27 Evolution Flying Wing BNF Basic is fast, furious, and seriously fun! But it can also gently cruise at lower speeds for a more relaxed flight. This model has a lightweight EPO frame with composite reinforcements for good durability, and it has low wing loading to keep it stable in the air. The unique attachment system keeps the wings secure and, with the right batteries, this speedy model can get up to a whopping 105mph! Finally, there’s also an optional nose which contains an FPV camera and video transmitter to make you feel as though you’re flying from the cockpit. It requires just a battery, transmitter and charger to get going, but shouldn’t be used by beginners due to the high speeds. Up next we’ve got the ARRIS Fixed Wing RC plane, which is user-friendly and extremely exciting thanks to the array of awesome features. This model has a lightweight, aerodynamic design, which reduces air resistance. This allows for a fast and stable flight, seamlessly reaching speeds of up to 100kmh! With three flight modes, Vertical, Level Auto-Stabilization and Horizontal Manual, this 6 channel RC plane is agile and fun. It’s easy to fly and control, and despite the advanced features, can be used by those with less experience. The brushless motor allows for extra power in the air. Finally, this RC has a buzzer alarm which sounds when you begin to run out of battery or signal. An incredible all-rounder that’s loved by everyone. The E-Flite Leader 480 airplane is an RC plane that packs a punch in the air, both in looks and performance. It has an attractive trim scheme and is made from a lightweight plywood construction. This model is suitable for intermediate to advanced pilots, but best suits those who want to perfect their precision aerobatics. The light wing loading allows it to move seamlessly in the air, and the colorful design means you always know which way is up mid-flight! Finally, this model is easy to set up, taking just a few hours to get it up in the air. It’s powered by an electric motor and comes with a 3s Li-Po battery and charger. Next, we’ve got the ParkZone F4F Wildcat which is another RC plane specifically designed for impressive aerobatics. This model is stable and easy to fly, completely with AS3X technology to keep it smooth in the air. This RC comes with an optional safe select flight mode assistance to make it suitable for beginners, and it has ample power thanks to the brushless motor system. This RC tackles wind and turbulence without a problem, and the price is brilliant for something so large. Perfectly mirroring the F4F Wildcat used from Pearl Harbor through to 1942, this model is a great collector’s item with a realistic paint scheme and intricate design. Another from E-Flight and we’ve got the EFL Valiant, a model that arrives almost ready to fly – you just need a transmitter, battery and charger. This is another model that’s great value for money. It has a high-output brushless power system to deliver that much needed adrenaline rush, but it’s also equipped with safe select technology which makes it suitable for beginners and smooth to fly. If you fancy landing on water, this RC can accept an optional float set. This takes just a few minutes to install and adds to the fun. The HobbyZone Mini Apprentice S BNF is a fantastic all-rounder; arriving ready to fly, complete with a powerful brushless motor. The best thing about this little model is the flight modes. Choose from Beginner, Intermediate or Experienced and up the level as you fine tune your skills. It comes with Safe Technology including a Panic Recovery mode, and comes equipped with a 1300mAh Li-Po battery. If you fancy landing or taking off from water, an optional float can be added in minutes. This also comes with tricycle landing gear for easy ground handling. The perfect all-rounder plane for camping trips with the family! 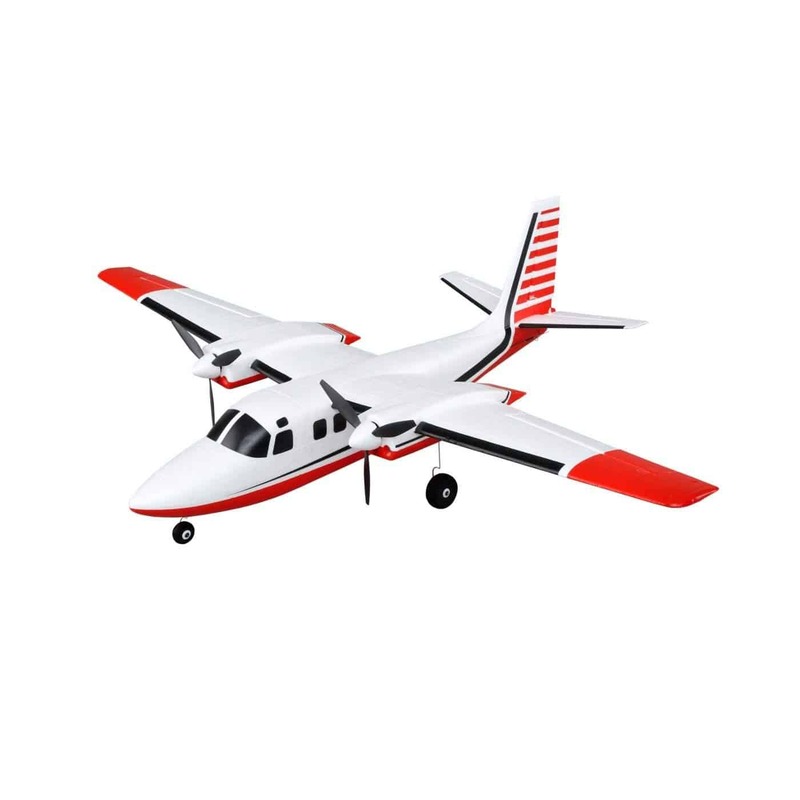 Next, we’ve got the EFL UMX Aero Commander BNF basic which is best loved for its lightweight body and efficient performance. The twin engine and powerful brushless motor make aerobatics easy – whilst the AS3X technology keeps this model stable and solid in the air. The three-color trim scheme prevents disorientation, and this model arrives fully ready to fly. The removable wire landing gear includes a steerable nose wheel for excellent ground handling, and this model comes equipped with a 2s Li-Po battery. This RC plane suits those with more experience due to the power, but it’s a great step up for those who have mastered the basics on an easier RC plane. Another by E-Flite now and it’s the turn of the U2980 UMX Radian. This is a whole lot of fun in a small package, and is a total delight to fly. The AS3X technology gives this model incredible stability even in wind and turbulence, while the unique wing shape allows it to glide smoothly through the air at speed. The brushed motor makes it suitable for beginners as the power isn’t too much to handle, and you just need a Li-Po battery to get going. Finally, despite the small size, this little model is speedy enough. It performs best in no wind and, if you’re a total beginner, try to have someone with more experience to help you. Next on the list we’ve got the FMS Sky Trainer 182, the upgraded version of the best-selling FMS Sky Trainer. This model comes equipped with LED lights, a carbon wing tub and a high power motor. The lights make it perfect for the odd night flight and can also prevent beginner pilots from becoming disorientated. The detail on the design of this model is second to none. It has a smoked glass canopy, ribbed control surfaces, steerable nose gear and reinforced wing struts. The PNP stands for Plug and Play, meaning you must provide your own transmitter. Other than that, it’s ready to go! Overall, a fantastic model – best suited to intermediate pilots looking to increase their skill. Yet another E-Flite model and it’s the UMX PT-17 which, like most E-Flite RCs, comes equipped with AS3X technology to make it a stable and solid fly. This RC plane is modeled after the full-scale PT-17 and the detail is fantastic. It’s realistic looking and ultra-lightweight – arriving fully assembled and ready to get going, you will just need to provide the transmitter. This model comes equipped with a Li-Po battery and charger which provides a solid amount of power, and the 4 channel control allows you to try your hand at some aerobatics. This little model is great for beginners and the perfect RC plane to perfect your skills. The ParkZone Night Vapor RC plane is a perfect for night flying, with pre-installed multi-colored LED lights. This allows you to spot it in the air and put on an awesome show when there’s not much light. This little model comes with removable landing gear and has a unique design that allows for easy replacement of broken parts. It’s 3 channel making it great for some basic aerobatics, and the Spektrum DSM2 radio technology allows for an interference free flight. Suitable for indoor use including basements, living rooms or even conference rooms, this model is perfect for beginners. All you need to get going is the transmitter. The HobbyZone HBZ T 28 Trojan arrives ready to fly straight out the box, and has a fantastic yellow design to help you spot it zooming through the air. Like most HobbyZone RCs, this little model is equipped with 3 flight modes; Beginner, Intermediate and Advanced. This makes it perfect if you’re looking to increase the challenge without buying a whole new RC. For beginners, this RC plane has Panic Recovery to prevent loss of control and crashes, while the durable construction is perfect for those with less experience. This plane takes off and lands well, and is seriously easy to fly. For a low budget option, this plane gets a 10/10. Whether you fancy perfecting your impressive aerobatics, or you simply want a zoom around the living room on a rainy day, you’re going to need to find your perfect RC plane. But there’s a big difference between the fast and furious race contenders, to the planes suitable for a quick spin around your backyard. Knowing what best suits you is essential if you want to get maximum fun (and minimal danger!) from the hobby. RC plane crashes can be damaging and dangerous, but they are easily avoided provided the user has experience and control. Beginner RC pilots should choose electric models that are designed to be flown in small, enclosed areas, before they opt for something with more power. Fuel powered RC planes can easily get out of control in the wrong hands. As you’ll have seen from this list, there’s a number of RC planes available that have different flight modes. These are perfect for beginners as they allow you to master the basics before taking on a new challenge, moving to the advanced modes when you are more confident. Other features to look out for include Safety Technology which can stop the plane from getting out of control, and AS3X technology to increase stability in the air. Durability is also essential as there’s bound to be a collisions when you start out. The least expensive RC planes are great for beginners and kids. They are usually made from plastic and aren’t particularly durable, but ideal for indoor use. They will have a smaller range and much less power but when it comes to mastering the basics, they certainly do the job. The middle ground is an RC plane that can be used outside in small areas but without the power of the bigger models. They’ll have brushed motors and won’t be able to cope with wind – but are the perfect step up from the budget models. These planes often have a variety of flight modes so are great for gradually increasing the challenge. Finally, at the top end of the scale are the fast and furious RC jets. These are seriously powerful, gas fueled planes. They are designed to be flown in large areas and you may be limited on where you can fly them. These are seriously fast and often very durable. They’re not suitable for beginners and can be dangerous in the wrong hands. The design of an RC plane is important, especially if you don’t have much experience. Beginners should have a plane with a stable design and a high wing configuration. A bright color so you can spot it in the sky is essential, and opt for a plane that has a different color for the front, back, top and bottom in order to prevent disorientation. Different RC features will add to the price tag but can make your RC plane more user friendly or add a new level of fun to the hobby. Single-channel or 2-channel RC aircrafts are generally just small toys and, while great for young kids, aren’t for pilots who wish to take the hobby seriously. The more channels you go for, the more your RC will cost – but it’ll also drastically increase the thrill. 3-channel planes can perform basic acrobatic moves, while 4-channel planes are more complicated but far and away the most fun. 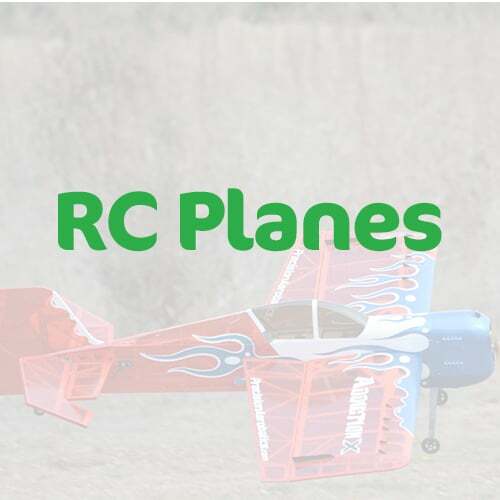 Electric powered RCs are good for beginners and have the added benefit of being able to be flown in public areas. They are quiet and can be found very cheaply. Engine powered RC planes are subject to restrictions and the engine costs a lot to maintain. They make a lot of noise, but they will give you a smooth and powerful flight. Many RC planes come with cameras which will significantly add to the price tag but can be a seriously exciting add on. RC planes with cameras can capture amazing quality footage which can then be uploaded to your phone or computer. Bear in mind that these cameras will reduce the battery life, and they will also be heavier. You will also be subject to restrictions in certain areas. If you are a beginner, you will likely need to replace some parts. It’s best to be prepared and getting an RC plane that has spare parts is the best option. Otherwise, they can be easily found online or on RC forums – but ask if you’re unsure what you need. Another great add on is Safe Technology. This will help keep your RC stable in the air and allow it to avoid small obstacles. It’ll make it easier to fly but will also increase the price. RC planes with the longest ranges are best for more serious pilots. Advanced RC planes will have a range up to a few hundred meters, while indoor models will have a much shorter range. Depending on your experience and where you’re planning on flying your RC plane will determine how important the range is. Landing gear will protect your RC plane if you have a heavier impact or you land on rough terrain. It will however make your RC a little heavier which may reduce your flight time. Overall, landing gear will make your RC plane more versatile and increase its durability. Hey I’m Clive! Thanks for checking out my guide to the best RC Planes! 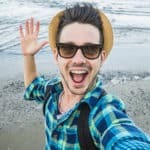 I’m a bit of a big kid at heart, so if you’re anything like me and you love reliving your childhood, this is the hobby for you!